Rheumatic heart disease is when heart valves become damaged due to a “Group A Streptococcal’ throat infection, more commonly known as strep throat. The infection usually occurs during childhood, but the heart damage only becomes apparent many years later. Today it’s standard for streptococcal infections to be treated with penicillin, resulting in virtual extinction of rheumatic heart disease in developed countries. However, in many developing countries where penicillin is not as easily available, streptococcal infection may go untreated. As such, rheumatic heart disease remains a problem in countries around the world. Rheumatic fever usually occurs 3 weeks after the streptococcal throat infection and can affect not only the heart, but the brain, joints and skin. The inside of the heart can get inflamed. Although less common, some patients experience severe valvular disease during this stage known as acute rheumatic carditis. Classic rheumatic heart disease usually occurs years later as a result of repeated attacks to the heart valves. Is Rheumatic Heart Disease Common? Rheumatic heart disease has virtually been eliminated in developed countries due to widespread access to healthcare and penicillin use. In developing countries, rheumatic heart disease remains a major public health concern. Rheumatic heart disease is a major cause of death in children in developing countries and is thought to cause at least 200, 000 early deaths per year. Each year around 350,000 children under the age of 15 get rheumatic heart disease and up to 20 million people worldwide are affected by it. What Exactly Causes Rheumatic Heart Disease? The streptococcal infection that underlies rheumatic heart disease is a ‘group A strep’ known as Streptococcus Pyogenes usually causing a throat infection. The exact way in which the heart disease occurs is not known; however, research suggests that rheumatic heart disease is caused by an immune response. Basically, the body reacts to a streptococcal infection in an attempt to defend the infection. Unfortunately, these same defense mechanisms attack the heart valves and lead to rheumatic heart disease. What Happens In Rheumatic Fever? The signs and symptoms of rheumatic fever happen about 3 weeks after the initial streptococcal throat infection. There can be a combination of arthritis affecting many joints, involuntary movements known as chorea, a ring like rash known as erythema marginatum, and nodules under the skin. The arthritis usually occurs first, and is present in up to 80% of patients. It is painful and can move from joint to joint. The chorea, which is the involuntary movement disorder typically, happens 1-6 months after the initial infection. This can occur in up to 1/3 of patients. In addition there is an effect on the heart known as carditis, which is basically inflammation of the heart. This usually happens a few weeks after the infection and can affect the sac around the heart and also the valves. 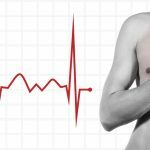 The signs and symptoms include a fast heart rate, a murmur and chest pain. 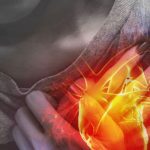 Many patients with rheumatic heart disease are unaware they ever had rheumatic fever in the first place, however they presents with the signs and symptoms of rheumatic heart disease years later, usually between the age of 20-50. The presenting symptom is usually shortness of breath. A heart murmur, caused by the valve disease is heart when listening to the heart. 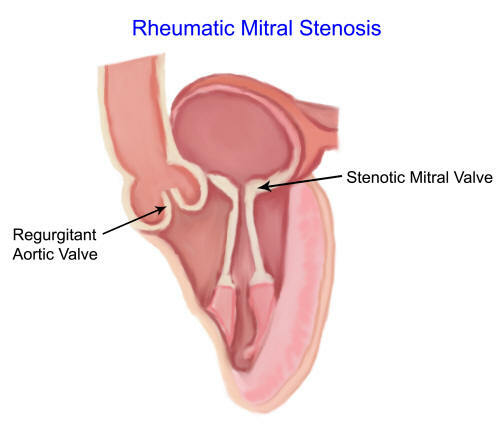 There is usually mitral regurgitation, a leaky mitral valve, however at later stages a tightening of the valve occurs known as mitral stenosis. The mitral valve disorders can often go without symptoms for several years before they present with signs and symptoms of heart failure such as fatigue, shortness of breath, swelling, and irregular heart rhythms such as atrial fibrillation. When echocardiograms, ultrasound scans of the heart are performed changes of the mitral valve can be seen. The mitral valve can be thickened, calcified, have restricted movement and the mitral valve leaflets fused together. The aortic valve may also be thickened. If severe enough, the valvular disease will be accompanied by evidence of heart muscle dysfunction. The main treatment for rheumatic fever is penicillin. The penicillin is given by injection. Other treatments are often used such as aspirin, steroids or immunoglobulin. These other treatments have not been proven to improve long-term outcomes such as valvular heart disease. 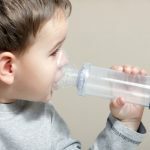 Some patients will have severe valve disease in the acute phase of rheumatic fever and may require surgery if medicines cannot stabilize the situation. There is no treatment for rheumatic heart disease; rather, treatment is centered on the complications of rheumatic heart disease. Penicillin taken for long periods of time after the initial infection is generally used. Complications of rheumatic heart disease include infections of the heart valves, showering of clots to the body, irregular heart rhythms such as atrial fibrillation and heart failure. Atrial fibrillation (without and with RVR) are treated with blood thinning medication and heart rate control. Heart failure is treated with medicines traditionally used to treat that such as beta-blockers and diuretics. Antibiotic prophylaxis for procedures should be used as determined by a physician. In pregnant patients, it’s important that specialists from both antenatal and cardiology manage cases because if not managed carefully the outcome can be very poor. When the valvular disease in rheumatic heart disease becomes severe treatment with surgery is typically required. This can be open-heart surgery or minimally invasive treatment through a catheter similar to a MitraClip or TAVR depending on which is most suitable. For leaky mitral valves, surgical repair is preferred over surgical replacement if possible. (If there is also valve tightening this may not be possible. For tight mitral valves, mitral stenosis, minimally invasive catheter treatment has replaced surgical valve replacement as the treatment of choice and has proven to yield good results.